Hello, my name is Dominic Mondon-Poirier, and I am 21 years old. At age 2, I was diagnosed with leukemia and received chemotherapy treatments for it over the next few years. At age 5, I became paralyzed from the waist down due to my final chemo dose being an overdose. As a result, I had to learn to use a wheelchair and learn new ways of doing everyday things. Despite the challenges I faced early on in my life, they have not stopped me from achieving great things thanks to the support of my family and friends. At the age of 9, I received the Richard A. Lapierre award from Easter Seals Massachusetts for showing independence skills while at camp. In high school I participated in both the Debate team and Key Club. 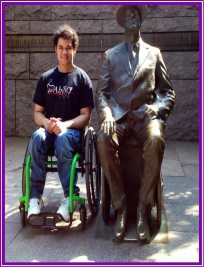 This past summer, I went to Washington, DC, where I lobbied for disability rights, just to name a few examples. I am currently a college junior aspiring to be a high school history teacher. I have worked very hard throughout my college career even though it can be challenging at times. Despite all of these accomplishments, however, there is still work to be done. I would like to thank everybody that has helped me get this far, and everyone at the Brianna Fund for helping me start the next chapter of my life. 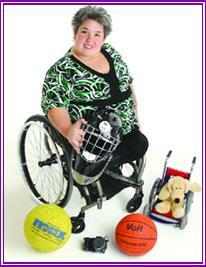 Nancy has been with CHD’s Disability Resources since 1997. She is committed to empowering people with disabilities by enhancing the self-confidence, interactive skills and physical abilities of her program participants. As Program Director for Disability Resources and Vice President of the Board of Stavros Center for Independent Living (a volunteer position), Nancy has played a vital role in the Western MA and Connecticut communities with her dedication and energy towards helping individuals with physical disabilities and visual impairments to get fit, be social and stay healthy. In addition, Nancy is very involved as an advocate for people with disabilities across the state. Nancy received her Bachelor’s Degree in Physical Education from Bridgewater State. She has received numerous awards and recognition for her work in our community, including: The Easter Seals Massachusetts Empowerment Award (2014) The Distinguished Service Award from Holyoke Community College (2012) The New England Wheelchair Athletic Association Hall of Fame (2011) The “40 Under Forty” Award from BusinessWest (2010) “Woman of Distinction” by the Western Mass Girls Scouts (2005) Stavros Center for Independent Living Ted Martineau Award for Outstanding Advocacy (2002) Governor’s Committee on Physical Fitness & Sports Neighborhood Superstar (2001) The Agawam Field Hockey’s Nancy Bazanchuk “Never Give Up – Never Give In” Award was named in her honor and is awarded every year since 1991 to a high school student who displays outstanding determination.